A couple of weeks ago there were only a few regular cops stationed at this opening in the border; now dozens of maroon-capped rapid-deployment police, a four-horse mounted border patrol and a platoon of helmeted Hungarian army soldiers carrying assault rifles. They wear grim faces. They mean business. The police commander steps to the white border markers and turns to the swarm of journalists gathered from around the world to cover the event: “Okay, game over. Move back!” he shouts in English. Police push journalists back about ten feet on the Hungarian side of the border and begin to block the entry of refugees from the Serbian side, directing them down a footpath to the regular frontier crossing about a mile away. 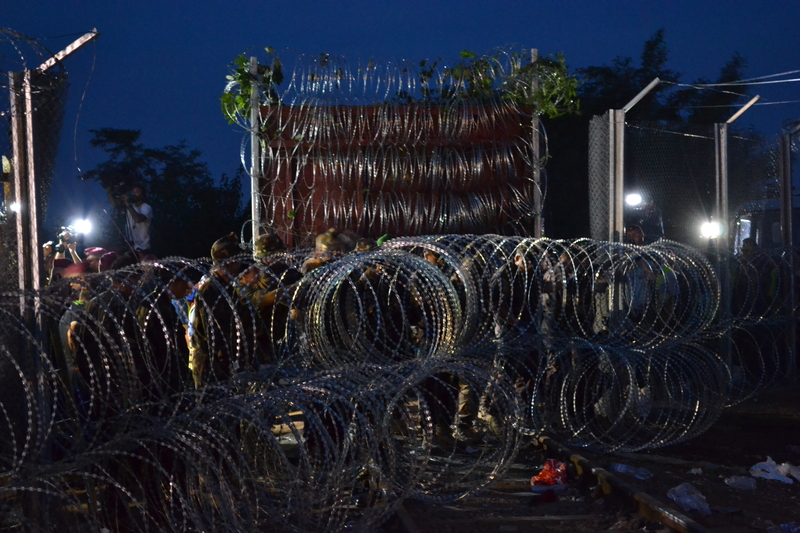 Soldiers and prison workers then begin erecting the final sections of fence and razor-wire alongside the railway tracks. The refugees are angry, bewildered: “Why Hungary do this to us? We not want to stay there. All we want is go to Germany.” Down at the regular frontier crossing: Hungarian police put the refugees on buses and take them away. Nobody knows where: camps in Hungary? The Eastern Railway Station in Budapest? The Austrian border? More importantly: how long will this last? Will midnight bring the total exclusion of refugees from Hungary? Back at the railway crossing: a boxcar with razor wire on the end rolls slowly into the gap in the fence and stops. Soldiers on ladders extend wire mesh from two metal posts to a frame on the boxcar. The border is sealed. Prime Minister Orbán says this marks the beginning of a new era (új időszámítás). But it looks more like the return of an old one.